Master your own NYC moment with a collection of perfectly curated eyeshadow shades. 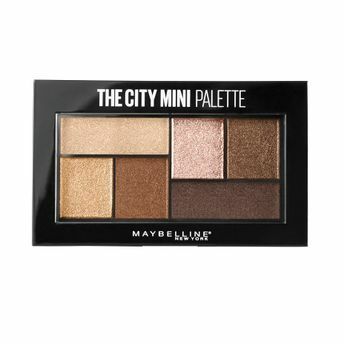 The City Mini Palette features six dramatic shades that are perfect for creating custom eye makeup looks. From Graffiti Pop and Concrete Runway to Rooftop Bronzes and Chill Brunch Neutrals, make a lasting impression with Maybelline's six-shade mini eyeshadow palette. Perfectly curated 6 color eye shadow palette. Pure color pigments melt onto the eyelid for dramatic impact in a single sweep. Super-saturated color pigments that deliver long-lasting finish. Create your own amped-up look in an instant. Explore the entire range of Eye Shadow available on Nykaa. Shop more Maybelline New York products here.You can browse through the complete world of Maybelline New York Eye Shadow .Alternatively, you can also find many more products from the Maybelline New York City Mini Palette Eye shadow range.